Anger is a completely normal, healthy human emotion. But when it gets out of control and turns destructive, it can lead to problems—at work, in personal relationships, and in the overall quality of life. Anger Management For Dummies provides trusted and authoritative information on anger management methods, skills, and exercises that will help you or a loved one identify sources of anger and release them healthily. 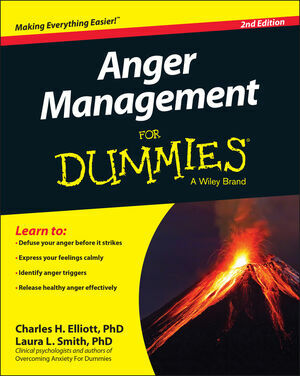 Anger has become one of the most intimate issues in today's world – as life, in general, has become increasingly stressful. . Anger Management For Dummies shows you how anger is often a bi-product of other more primitive emotions, such as fear, depression, anxiety, and stress, and arms you with the strategies that can help you conquer them. Inside, you'll discover how to overcome obstacles to change, rethink rage, confront anger head-on with healthier responses, and much more. With the tools, tips, and strategies provided in this hands-on guide, you'll find everything you need to overcome anger and live a happier, more productive life. Charles H. Elliott, PhD, is a clinical psychologist and a Founding Fellow in the Academy of Cognitive Therapy. Laura L. Smith, PhD, is the president-elect of the New Mexico Psychological Association. Together, they coauthored Borderline Personality Disorder For Dummies and others.